Photographer and picture framer, initially at 10 Grange Road, but later at Victoria Road, Southwick. As the First World War intensified, many photographers were obliged to retire because of declining business, but Ripley chose to enter the profession, seemingly undeterred by the challenges that lay ahead. He is listed at Grange Road in both Kelly's 1915 and 1918 Sussex Directories. The 1919 Electoral Register gives his address as 48 Southview Road, but whether this was his place of business or his home is unclear. By 1922 he had moved his business to Victoria Road to take over the Victoria Studio, which had once belonged to John Benn (see the entry for Benn & Cronin). Directories in the 1920s describe him as a "picture frame maker and trade photographer". He was still in business in the early 1930s. Many of Ripley's real photographic cards are numbered. His large selection of Southwick cards includes an assortment of views of the Green, both during the war, when it was requisitioned by the army and covered in wooden accommodation huts, and in peacetime, after the huts were cleared and it once again became public open space. Also interesting are his cards of Southwick lifeboat and its crew (No. 98) and the view looking eastwards towards Brighton from the top of one of the giant Mystery Towers near the entrance to Shoreham Harbour (No. 161, entitled "From the air [The Canal]"). Ripley became fascinated by the Towers, and photographed them at every stage in their construction, starting in late 1917 or early 1918. In the end it became an obsession with him, and he issued possibly as many as 75 different cards of the Towers. Their purpose was a closely guarded military secret, but needless to say the public were so enthralled they bought Ripley's cards in large numbers. One inspired night scene that he sold is entitled "While Southwick Sleeps the Naval Monsters Grow". The towers were still incomplete when the war ended. 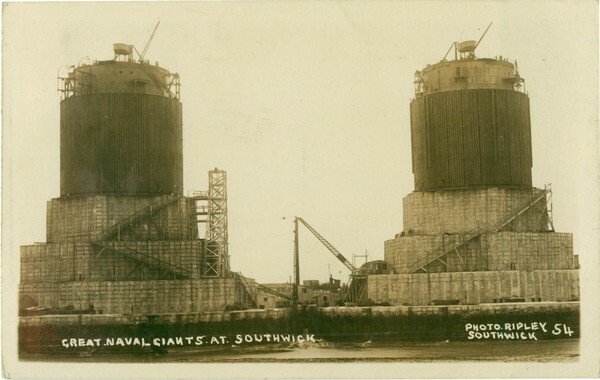 One was dismantled and the other towed away in September 1920 to the south-east of the Isle of Wight, where it was grounded on the sea bed to form a replacement for the Nab lightship. Ripley published many real photographic cards of Shoreham (including the Bungalow Town), Lancing, Sompting and Portslade. Particularly attractive are some of his cards of Sompting (for example, the Main Street, Vicarage and the Marquess of Granby pub) and the Downs around Lancing and Shoreham (for example "A stretch of the South Downs", "A picturesque Farm amongst the Downs" and "Harvesting on the Sussex Downs"). Ripley also marketed a selection of Hove cards (such as The Drive, the unveiling of Hove War Memorial, and Brunswick Lawns, No. 72), despite facing stiff competition from other publishers. He even established a presence in Patcham with such cards as "A Sussex windmill" (No. 109), which shows Patcham Mill, and No. 191 showing the Chattri or Indian War Memorial. The Peace Decorations in Kingston Church were the subject of yet another card. In 1919 Ripley photographed the launch of a reinforced concrete tug, the Cretegaff, from John Ver Mehr's yard on the south bank of the Adur at Shoreham. Steel was in short supply because of the war, and the yard mainly used Shoreham shingle, sand from Storrington and cement from Beeding to build the vessel. In the 1930s the Cretegaff briefly carried English daily newspapers from Liverpool to the Isle of Man before being converted into a grain barge. It now forms part of the seawall at Carlingford Marina in Northern Ireland. Ripley's cards typically have black and white pictures with white borders and handwritten captions. On some cards the captions are entirely in capitals; on others capitals are used only at the start of words. As a rule the lettering is fairly plain, but leading capitals often have an outward curving base, and in a few cases a very fancy script was employed for the captions - presumably this was the work of an assistant. The cards are usually marked "Photo. Ripley, Southwick" at the base of the photographs. Most cards have a serial number; the highest number noted to date is 282 (this is a card showing H. R. H. Princess Mary at the Sussex County Hospital, November 22, 1921). Cards of the Mystery Towers appear to have been separately numbered from the rest. No postcards from the 1930s have been found that are marked "Ripley", but an anonymous view of Southwick Jubilee Celebrations in 1935 could well be his work. Ripley was born towards the end of 1889 at Twickenham in Middlesex. His father, Joseph Ripley, a grocers' warehouseman, had been born at Little Missenden in Buckinghamshire in 1862. His mother, Ellen, was the daughter of Rachel and Abraham Benn, a horse and cattle dealer. She was 2 years younger than her husband. In 1901 the Ripleys were living at 2 Adbury Villas in Twickenham; Joseph was 11 and still at school. The 1911 census records that Joseph had become a picture frame maker; he had already moved to Sussex and was boarding with John and Winifred Brenchley at a house called Riversdale at Kingston-by-Sea. It was presumably after this date that he acquired his photographic skills. In the spring or early summer of 1915 he married Amy Sarah Hoddinott at Ticehurst. In the early 1930s he and Amy lived at Redcot, Hangleton Road in Hove. He died before Amy, on July 26, 1933, at Folkestone Hospital, leaving effects of £3023. In Pike's 1934-35 Direcctory the Victoria Studio is still listed under his name, which suggests that Amy may have kept it going, perhaps by employing a former assistant. It closed for good, however, by the end of the 1930s. Ripley's postcards of soldiers training at Shoreham before the Great War are the subject of a very interesting video compiled by Neill Deville that can be found on Youtube (see www.http://www.youtube.com/watch?v=0LcePmSYfZY).